In the spirit of tradition that dates back to at least the 17th century, it’s time to hunt some eggs! Here’s some local hunts to take the family to this year. Ages 1-12 welcome to come hunt over 25,000 eggs! There are age designated hunting areas, prizes to be won, as well as photos with the Easter Bunny himself! This is the largest egg hunt in the area! 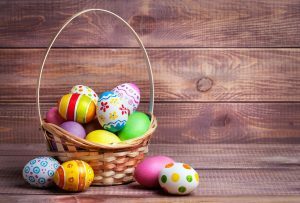 All ages welcome for an easy going egg hunt at the Gables of Ammon! Kids up to the age of 12 are invited to come hunt for eggs! This hunt is for children 12 and under and will be split into age appropriate groups. Note that there is a location change this year due to high water levels in Jensen Grove. The morning starts with a pancake breakfast served at 7:30 am at Mountain View Middle School to raise funds for the Civil Air Patrol. Then the Blackfoot Chamber of Commerce invites children 12 and under for the hunt at the youth soccer fields right across the street on Mitchell Road. There will be a section for special needs children as well! Participating merchants will have Easter Eggs for the kids beginning at 11am until all of the eggs are gone. There will be thousands of eggs for the kids and plenty of time for families to walk through the beautiful shops and restaurants. Plan to spend a while enjoying the spring charm of Old Town Pocatello. We expect a visit from the Easter Bunny, too! Join the fun at Shelley city park! Held at Iona Square just behind the Iona city building, this hunt has eggs and prizes for kids up to age 11. Hot chocolate is provided by the city and there is a special prize for finding the “golden ticket”! Bring your own basket to hunt at Irwin Park! Bike raffles in each age category! Come enjoy food and fun with the whole family, donations welcome!